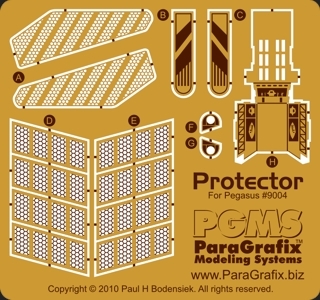 The must-have accessory for anyone planning to light Pegasus Hobby's new NSEA Protector kit*, this photoetch provides opaque engine grills to enhance your lighting. Also includes engine enhancements for the command deck landing craft to detail the back of the engines, and cover the hollow undersides of the engines. A flight deck is also included**. * Electronics not included. Visit Voodoo FX for their lighting kit. (As of press-time, their kit is still under development and we do not know their expected delivery date. ** Because the movie's flight deck is a major victim of the "Tardis affect", the photoetched insert is not accurate to the film's matte painting.